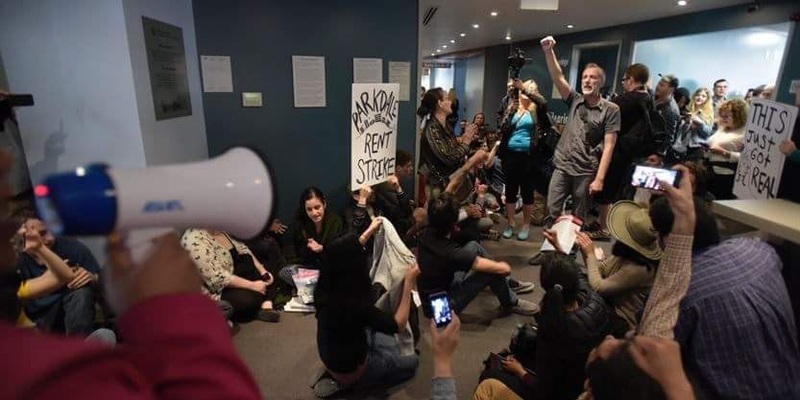 Today nearly 100 rent strikers and supporters occupied the Landlord and Tenant Board to protest the scheduled above guideline rent increase hearing on AIMCO and MetCap’s application against tenants at 87 Jameson. The occupation was successful and ensured the Board could not approve the increase today. Rent strikers understand the Board is set up to approve landlords’ applications for rent increases above the guideline, increases which which push working class tenants out of their homes. They will continue to to push their demand that AIMCo and MetCap fully withdraw their rent increase application and resist any ruling of the Board which approves the increase.